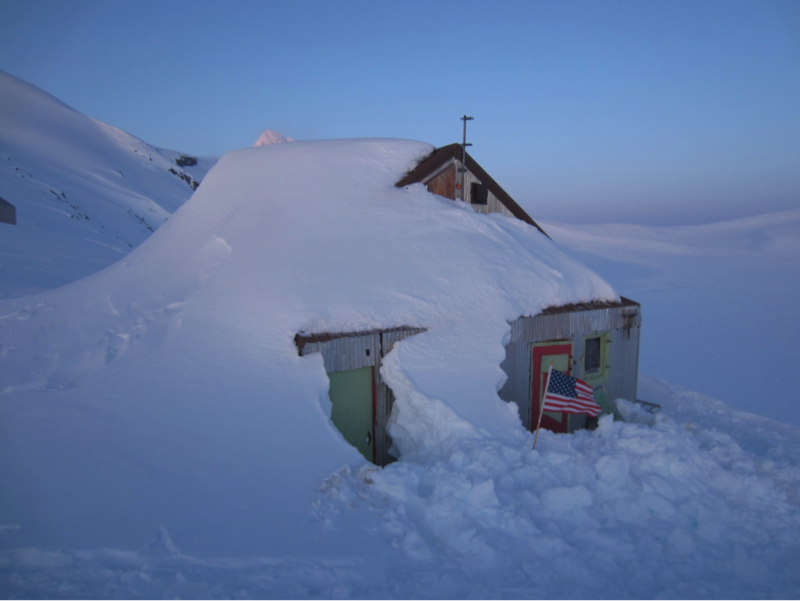 During the first week of April 2013, Pat Dryer from University of Alaska Southeast, and Shad O’Neel and I from the US Geological Survey, flew to Camp-10 on the Juneau Icefield. We landed on the main trunk of Taku Glacier just below C-10 and unloaded our gear from the ski plane. The engine started and the plane took off, leaving just the three of us among the vast expanse of the Taku. Slogging what gear we would need immediately, we skinned up the nunatak to the almost completely buried camp. We spent the following hours digging into various buildings of C-10, retrieving what supplies and items we would need for our research over the next few days. Our purpose for coming to C-10 so far removed from the normal field season of the Juneau Icefield Research Program (JIRP) is related to a project aimed at better understanding runoff into the Gulf of Alaska (GOA). The Taku River is a large contributor of fresh water to the GOA. Our task this spring was measuring snowfall at multiple glaciers around the GOA where we used high frequency ground penetrating radar (GPR) to determine winter snowfall. Our aim is to connect the glacier mass balance with the hydrology, which carries nutrients to the ocean, drives the Alaska Coastal Current, and ultimately feeds the critters that we end up eating! Over the next few days we collected GPR data along the main trunk of the Taku Glacier, including the historic survey line of “Profile 4” just in front of C-10. 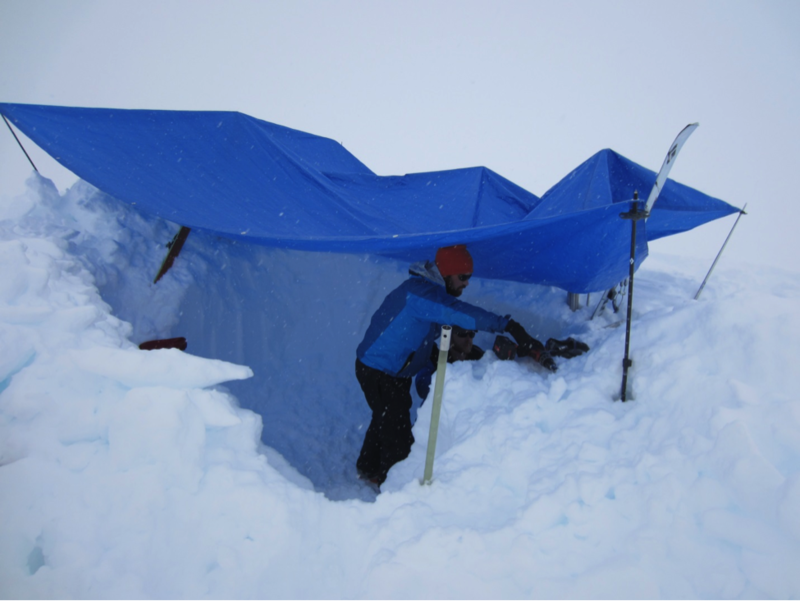 We also completed a snow pit at the long measured “Taku Glacier test pit #4”, a snow pit that has been dug in front of C-10 every summer by JIRP participants since the late 1940s. With a large storm system threatening to pin us in camp for what could have been a week, we had Coastal Helicopters pick us up. Touching down in Juneau, Shad and I soon hopped on a plane back to Anchorage, making the C-10 to Anchorage traverse in just 12 hours! Our nightly readings of the literature in the radio room at C-10 informed us that we were the first people doing fieldwork out of C-10 during April since 1966. As Shad and I are both JIRP alumni we were proud to be part of another milestone in JIRP history. Although we didn’t accomplish everything we hoped to, we got a good start on the project. When combined with all the other field data collected this spring, the Taku data will help to fill a big gap in snowfall measurements around the state. In future trips we will continue accumulation measurements and place ablation wires along the centerline of the ablation zone of the Taku. The data collected this spring and in future trips will supplement measurements made by JIRP participants and also be a large part of my graduate thesis.